First of all, happy new year everyone! I hope you’ve all had a fantastic start to the year so far. I just came back from my trip to Japan and I had a blast. I hauled a whole bunch of beauty goodies too (check them out on my Instagram here) and I’m excited to start reviewing everything I got. Let’s start on the first one then, shall we? So like a lot of people, I wasn’t born with perfect 20/20 vision. I, of course, wear glasses, but I prefer wearing my contact lenses when I’m going out. Only trouble is that my eyes are easily prone to dryness with them on, so I constantly have to have eye drops with me wherever I go. They only provide temporary relief as my eyes still dry up a lot throughout the day, but I’ll take that over no relief at all. With dry eyes comes tired eyes, so I really needed something that wouldn’t only re-moisten my lenses and eyes, but make them feel more refreshed and ‘awake’ again. 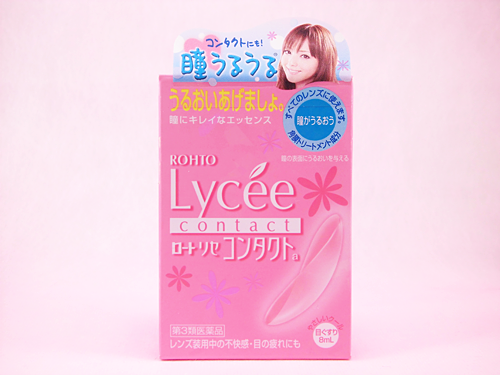 So I decided to pick up this Rohto Lycee Contact (¥735‎.00) eye drops while I was in Tokyo. I had heard about the ordinary eye drops for non-contact lens wearers and how effective they were at really cooling and refreshing the eyes, so I figured this would be great for someone like me! I’m loving the super, pink girly packaging right off the bat. As you may have already figured, these eye drops are specifically for when you’re wearing your contact lenses. Featured on the box is Sasaki Nozomi, a really popular Japanese model. Rohto Lycee eye drops is the solution for contact lens users that need to get moisture back in their eyes and suppress discomfort that might arise after prolonged wear of hard or soft contact lenses. Rohto Lycee Contact contains a keratinous treatment add HEC component that treats dry eyes, and has an easy to use free angle nozzle. 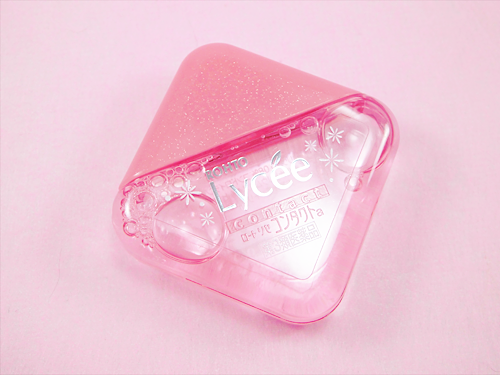 The actual bottle, which holds 8ml of solution, is just as girly as the outer packaging – all pink with a sparkly pink cap to top it off too. The plastic body is just flexible enough to make it easy to squeeze without over dispensing the solution like I almost always seem to do with other bottles. I manage to get exactly one drop with this each time. A unique feature of the bottle is its ‘free angle nozzle’ which can dispense the solution from any angle, even when it’s on its side like this. I’m still sticking to the traditional dip-your-head-back method though. Prior to trying these drops, I had heard about how the solution really makes your eyes feel minty cool and they honest to goodness do! It’s still always a pleasant surprise to me whenever I use this. Some people have complained about the feeling being ‘weird’ or they simply didn’t like it, but I do because it instantly makes my eyes feel refreshed again as if I had just popped in my contacts for the first time that day. My contacts are completely moistened again too, of course. I read that this product actually has the lowest level (1) of cooling effect compared to some of the other Rohto eye drops and that the highest is 7! I think the most I’ll be able to handle is 2 or 3, to be honest! However, the cooling effect is also supposed to have an added advantage for people who sometimes suffer from bloodshot eyes as the ‘coldness’ restricts the blood vessels in your eyes to make them clearer and brighter. Unfortunately, the overall effects of the drops only last about half an hour to an hour for me before my eyes feel dry and tired again. Can’t blame the product for it though because it’s the same case for all my eyedrops once I’ve worn my contacts for a few hours. My eyes are just naturally prone to dryness, even more so with my contacts on. But the instant cooling effect of the solution is kind of what wins me over makes me like this product the most and I’m already planning to buy a couple more once I start running low on my current one! Re-moistens hard or soft contact lenses. Might be a little pricey for some in relation to the amount of product you get. Because of the small amount of product you get, I might run out of this quite fast as I use it nearly everyday and multiple times within a day.